A one-hour lunch and learn, “Spreading a Positive Attitude,” was held on January 25, at the Geneva Public Library in Geneva. Mike Henke, from Mike Henke Inc., of Doniphan, was the speaker. Henke presented “Spreading a Positive Attitude” to the 50 participants from across Fillmore County. Henke has always been interested in people and he believes a positive workplace culture is a business’s best recruiting tool. It begins with having a positive mindset, a positive tone and pitch of your voice. Henke dispelled several “myths” that people believe hinders positive attitudes. He offered ideas on how to get past the ideas that you can’t change people, employees are hard to find so we have to be lenient, people do not like change, you can’t just “Be Positive” and workplace culture is overrated. 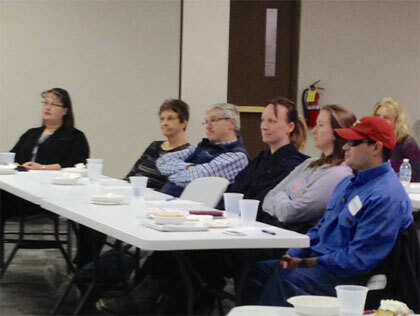 The Fillmore County Development’s Leadership Development Committee sponsored the lunch and learn. A grant from the Shickley Community Foundation helped with the cost of the speaker.